Microsoft launches insider program for... Solitaire?! Microsoft’s Insider early-access program worked so well for Windows 10, that it brought it to Windows Mobile. And Office. And now, well, Solitaire. It’s not quite the same thing, but Microsoft’s Casual Games Inner Circle program will allow fans of Solitaire, Mahjong, Jigsaw, and others to sign up and help contribute to the development of the new games. In a blog post, Microsoft promised that the new program will offer early access to “new builds,” as well as the chance to influence new features and collaborate on the new games themselves. 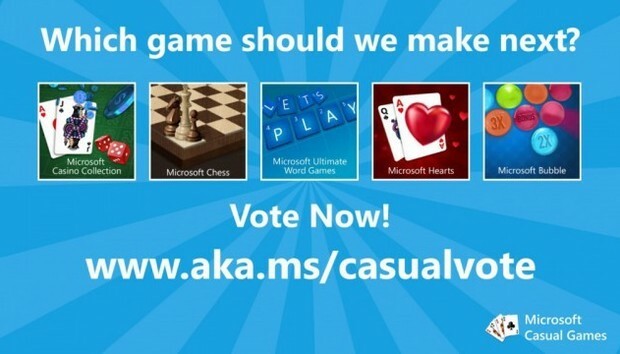 As part of the new program, Microsoft is offering the chance to vote on what game the company makes next: Microsoft Casino Collection, Microsoft Chess, Microsoft Ultimate Word Games, Microsoft Bubble, or Microsoft Hearts. To do so, visit the Microsoft Web page and scroll down to the bottom, where you’ll have a chance to vote for your top three choices. Voting will close Dec. 17, so you’ll have to act fast. “The earlier in the development process we can pinpoint what our players want and don’t want, the higher chance we have to exceed their expectations,” Kevin Lambert, design director for the Microsoft Casual Games team, and Derek Dutilly, lead producer, wrote in the blog post. Why this matters: Microsoft has developed a reputation for actively seeking out the feedback of its user base, one that has helped to engender goodwill and a feeling that this iteration isn’t necessarily the “M$” of old. It may seem a little silly to ask what longtime Solitaire fans think, but it’s not hard to believe that the userbase who plays Microsoft’s casual games are really engaged. No word yet on whether Microsoft will take its bizarre Solitaire-as-subscription model and apply it to other casual games, though. Not surprisingly, Microsoft has launched a Casual Games blog, where anyone can check up and see what Microsoft’s up to. Early posts introduced users to the team and the business. One exception, however, is a fascinating blog post by Lambert which delves into the history of Solitaire, which launched with Windows 3.0. As Lambert explains, there was an ulterior motive for including it. Solitaire in Windows 8, snapped to a column on the screen. Microsoft continued its strategy for Windows 8, building in similarities between the Windows 8 home screen and the Solitaire layout, and redesigning the app so that it was playable in “Snap View,” even when resigned to a vertical column on one side of the screen. And for Windows 10, the team wanted to show off how the content will resize and “flow” across different form factors, much like the Continuum features in Windows 10. As the window shrinks, Solitaire will resize elements of the design to make it more accessible.